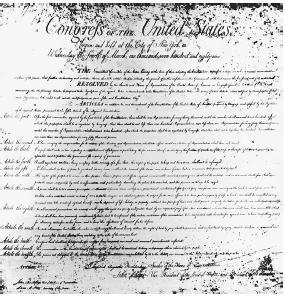 In this 1789 draft of the Bill of Rights, the Tenth Amendment to the Constitution appears as Article the Twelfth, reserving to the states or to the people powers not delegated to the federal government. Ratified in 1791, the Tenth Amendment to the Constitution embodies the general principles of Federalism in a republican form of government. The Constitution specifies the parameters of authority that may be exercised by the three branches of the federal government: executive, legislative, and judicial. The Tenth Amendment reserves to the states all powers that are not granted to the federal government by the Constitution, except for those powers that states are constitutionally forbidden from exercising. For example, nowhere in the federal Constitution is Congress given authority to regulate local matters concerning the health, safety, and morality of state residents. Known as police powers, such authority is reserved to the states under the Tenth Amendment. Conversely, no state may enter into a treaty with a foreign government because such agreements are prohibited by the plain language of Article I to the Constitution. At the time the states adopted the Tenth Amendment, two primary conceptions of government were under consideration. Many federalists supported a centralized national authority, with power concentrated in a single entity. This type of government was exemplified by the English constitutional system, which vested absolute authority in the monarchy during the seventeenth century and in Parliament during the eighteenth century. On the other hand, many anti-federalists supported a more republican form of government consisting of a loose confederation of sovereign states that would form an alliance only for the purpose of mutual defense. The Articles of Confederation, which governed the 13 states in national matters until 1787, when the Constitution was ratified, epitomized this form of government. Under the Articles of Confederation, the national government was unable to levy and collect taxes on its own behalf. Many federalists, such as James Madison, argued that the Tenth Amendment was unnecessary because the powers of the federal government are carefully enumerated and limited in the Constitution. Because the Constitution does not give Congress, the president, or the federal judiciary the prerogative to regulate wholly local matters, Madison concluded that no such power existed and no such power would ever be exercised. However, British oppression had made the Founding Fathers fearful of unchecked centralized power. The Tenth Amendment was enacted to limit federal power. Although it appears clear on its face, the Tenth Amendment has not been consistently applied. Before the Civil War, nearly every state urged a broad reading of the Tenth Amendment. Although no state wanted a federal government that was impotent against internal enemies or foreign aggressors, many state politicians challenged the authority of the federal government to regulate any matter that could otherwise be handled by local authorities. For example, immediately after the U.S. Revolution, all 13 states resisted federal efforts to force local governments to return the property of British loyalists taken during the war. During the first half of the nineteenth century, Southern states objected to federal legislation that attempted to limit Slavery. State sovereignty reached its height when 11 states seceded from the Union to form the Confederacy. Following the Civil War, the Tenth Amendment was virtually suspended. For a number of years during the Reconstruction era, the federal government occupied the former Confederate states with military troops and required each occupied state to ratify the Civil War Amendments, which outlawed slavery, gave African Americans the right vote, and declared the equality of all races. To a large extent the federal government ran local matters in Southern states during this period. In 1883, the Tenth Amendment regained some of its force. In that year the Supreme Court invalidated the federal civil rights act of 1875 (18 Stat. 335), which criminalized racial discrimination in public accommodations, such as hotels and restaurants, because it violated state sovereignty under the Tenth Amendment (civil rights cases, 109 U.S. 3, 3 S. Ct. 18, 27 L. Ed. 835 ). In 1909, the Supreme Court struck down the White Slave Traffic Act (34 Stat. 898), which Congress had passed to prohibit the harboring of alien women for the purposes of prostitution, because it violated the Tenth Amendment (Keller v. United States, 213 U.S. 138, 29 S. Ct. 470, 53 L. Ed. 737 ). Nine years later the Court struck down another congressional law prohibiting the interstate shipment of products that had been manufactured by certain businesses that employed children under the age of 14 (hammer v. dagenhart, 247 U.S. 251, 38 S. Ct. 529, 62 L. Ed. 1101 ). "In interpreting the Constitution," the Court said in Hammer, "it must never be forgotten that the nation is made up of states to which are entrusted the powers of local government. And to them the powers not expressly delegated to the national government are reserved." During the depth of the Great Depression, the Tenth Amendment returned to a dormant condition. President franklin roosevelt worked with Congress to pass the New Deal,a series of programs designed to stimulate the troubled economy. After the Supreme Court upheld a provision of the National Labor Relations Act (mandatory Collective Bargaining) in nlrb v. jones & laughlin steel corp., 301 U.S. 1, 57 S. Ct. 615, 81 L. Ed. 893 (1937), Congress began exercising unprecedented lawmaking power over state and local matters. For the next 40 years, the Supreme Court upheld congressional authority to regulate a variety of matters that had been traditionally addressed by state legislatures. For example, in one case the Supreme Court upheld the Agricultural Adjustment Act of 1938 (7 U.S.C.A. §§ 1281 et seq.) over objections that it allowed Congress to regulate individuals who produced and consumed their own foodstuffs entirely within the confines of a family farm (Wickard v. Filburn, 317 U.S. 111, 63 S. Ct. 82, 87 L. Ed. 122 ). The Tenth Amendment enjoyed a brief resurgence in 1976 when the Supreme Court held that the application of the Fair Labor Standards Act of 1938 (29 U.S.C.A. §§ 201 et seq.) to state and local governments was unconstitutional. In National League of Cities v. Usery, 426 U.S. 833, 96 S. Ct. 2465, 49 L. Ed. 2d 245 (1976), the Court said that the Minimum Wage and maximum hour provisions of this act significantly altered and displaced the states' abilities to structure employment relationships in such areas as fire prevention, police protection, sanitation, public health, and parks and recreation. These services, the Court emphasized, are historically reserved to state and local governments. If Congress may withdraw from the states the authority to make such fundamental employment decisions, the Court concluded, "there would be little left of the states' separate and independent existence," or of the Tenth Amendment. National League of Cities proved to be an unworkable constitutional precedent. It cast doubt on congressional authority to regulate many aspects of local affairs that most of society had come to rely upon. It was unclear, for example, whether the Occupational Safety and Health Administration (OSHA), a federal agency established by Congress to regulate workplace safety, retained any constitutional authority after the Supreme Court announced its decision in National League of Cities. The Supreme Court eliminated these concerns by overturning National League of Cities in Garcia v. San Antonio Metropolitan Transit Authority, 469 U.S. 528, 105 S. Ct. 1005, 83 L. Ed. 2d 1016 (1985). In Garcia the Court upheld the minimum wage and maximum hour provisions of the Fair Labor Standards Act as it applied to a city-owned public transportation system. In reaching this decision, the Court said that if certain states are worried about the extent of federal authority over a particular local matter, the residents of such states should contact their senators and representatives who are constitutionally authorized to narrow federal regulatory power through appropriate legislation. Judicial Review of federal regulations under the Tenth Amendment, the Supreme Court suggested, is not the proper vehicle to achieve this end. The ebb and flow of Tenth Amendment Jurisprudence reflects the delicate constitutional balance created by the Founding Fathers. The states ratified the Constitution because the Articles of Confederation created a national government that was too weak to defend itself and could not raise or collect revenue. Although the federal Constitution created a much stronger centralized government, the Founders did not want the states to lose all of their power to the federal government, as the colonies had lost their powers to Parliament. The Tenth Amendment continues to be defined as courts and legislatures address the balance of federal and state power. Derthick, Martha. 2001. Keeping the Compound Republic: Essays on American Federalism. Washington, D.C.: Brookings Institution. Killenbeck, Mark R., ed. 2002. The Tenth Amendment and State Sovereignty: Constitutional History and Contemporary Issues. Lanham, Md. : Rowman & Littlefield. Constitution of the United States; Federalist Papers; States' Rights. Those two arguments are: (1) Congress' power to regulate interstate commerce does not extend to the regulation of goods manufactured and sold in an entirely intrastate market, and (2) because the Constitution is silent as to the issue of intrastate commerce, the right to regulate such commerce is reserved for the states by the Tenth Amendment. Alaska passed a similar law in 2013, as did Idaho in 2014, according to the Tenth Amendment Center. the limits that the Tenth Amendment places on congressional power. Despite the text of both Article VI and the Tenth Amendment, however, the Court in the 1990s held that when Congress exercises enumerated powers under Article I, it may not require states to assist in the implementation of federal law. 59) Though the legislation was written with an eye toward potential Tenth Amendment and Contracts Clause problems, it was declared unconstitutional in Ashton v.
And, just to make this complete, numerous states have proposed laws for one or more of these causes: gold and silver as legal tender, Tenth Amendment recognition, sheriff primacy (over federal lawmen), National Guard protection, and freedom from federal regulation of hemp, food, and the environment. The Supreme Court overruled the past holding in Pollock and found that TEFRA did not violate the Tenth Amendment and that interest on state and local government bond debt is not immune from non-discriminatory federal tax. Let the silence after the Tenth Amendment linger for a moment. Will you ignore bill of rights day on Dec. 15? "All of the Bill of Rights for all of the people"
One reason is presidential candidates who want a smaller federal government and the restoration of the Tenth Amendment to its original meaning. DSHEA--from safe harbor to sinking harbor: is there a way to bypass the FDA's regulatory roadblocks? I referred to the Tenth Amendment only when speaking about these kinds of benefits 6 not marriage.